A reversible lane (British English: tidal flow) is a lane in which traffic may travel in either direction, depending on certain conditions. Typically, it is meant to improve traffic flow during rush hours, by having overhead traffic lights and lighted street signs notify drivers which lanes are open or closed to driving or turning. Reversible lanes are also commonly found in tunnels and on bridges, and on the surrounding roadways – even where the lanes are not regularly reversed to handle normal changes in traffic flow. The presence of lane controls allows authorities to close or reverse lanes when unusual circumstances (such as construction or a traffic mishap) require use of fewer or more lanes to maintain orderly flow of traffic. Some more recent implementations of reversible lanes use a movable barrier to establish a physical separation between allowed and disallowed lanes of travel. In some systems, a concrete barrier is moved during low-traffic periods to switch a central lane from one side of the road to another; some examples are the five-lane San Diego-Coronado Bay Bridge in San Diego, California, the former seven-lane Tappan Zee Bridge on the Hudson River in New York and the eight-lane Auckland Harbour Bridge across the Waitematā Harbour in Auckland, New Zealand. Other systems use retractable cones or bollards which are built into the road, or retractable fences which can divert traffic from a reversible ramp. The two center lanes of the six-lane Golden Gate Bridge are reversible; they are southbound during morning rush hour and northbound at evening rush hour. Prior to the installation of a movable median barrier in January 2015, they were demarcated by vertical yellow markers placed manually in sockets in the roadway. Many urban freeways have entirely separate carriageways (and connecting ramps) to hold reversible lanes (the reversible lanes in such a configuration are often referred to as "express lanes"). Generally, traffic flows in one direction or another in such a configuration (or not at all); the carriageways are not "split" into two-lane roadways during non-rush periods. Typically, this sort of express lane will have fewer interchanges than the primary lanes, and many such roadways only provide onramps for inbound traffic, and offramps for outbound traffic. Historically, the term "suicide lane" has also referred to a lane in the center of a highway meant for passing in both directions. Neither direction has the right-of-way, and both directions are permitted to use the lane for passing. In a similar layout, three lanes are striped with two in one direction and one in the other, but traffic in the direction with one lane is allowed to cross the centerline to pass. 2+1 roads have replaced some of these, mainly in Europe. A typical five-lane arterial equipped with a center turn lane. These are often found in cities, towns and developed areas near cities. In the United States, the sequence line is located on the inside of the lane (sometimes with left turn arrows for both flows ). In Canada it is the same for all provinces with the exception of Ontario, where the sequence line is located on the outside. Another type of center two-way lane is a "two-way left turn lane" (TWLT) or "center left-turn lane", or (for countries that drive on the right) "center turn lane" or "median turn lane", a single lane in the center of the road into which traffic from both directions pulls to make a left turn. While this is sometimes also called a "suicide lane", it is actually far safer, as traffic collisions occur at far lower speeds. These roads are very common in suburban areas and less common in rural areas, though they are frequent around developed areas near Interstate Highway bypasses in the United States. Many were divided highways before the median was demolished or otherwise replaced by the turn lane. Many four-lane streets with a center double yellow line are being phased out in favor of 3- or five-lane streets with center turn lanes because the center lane allows for less disruption of traffic flow. For routes with moderate traffic, other movements involve downgrading four-lane undivided streets to three-lane streets with a turn-only center lane. This center lane can be used by emergency vehicles like police cars, ambulance, and fire trucks to avoid traffic traveling in either direction. Drivers are not allowed to use the center lane of such a highway for passing slow-moving vehicles, except when funding or space constraints dictate use of it as a rush hour "travel lane" when traffic is largely asymmetric between a central business district and its suburbs. U.S. Route 13 near the Greenville, North Carolina, city limits is a rare instance of a posted warning sign that states "do not pass in center lane". Connecticut Avenue in Washington, D.C.
Chain Bridge in Washington, D.C.
Pre-upgrade Bailey Bridge, in Coquitlam, B.C. The Peace Bridge between the U.S. and Canada, connecting Fort Erie, Ontario to Buffalo, New York. Three lanes total, all marked reversible, one reversed in the direction of rush hour flow with the possibility of all lanes flowing in the same direction based on traffic needs. The Lewiston-Queenston Bridge connecting Niagara-on-the-Lake, Ontario to Lewiston, New York. Five lanes total, all marked as reversible, one to four lanes marked daily in the same direction, depending on traffic needs. In addition to the directional signals, special signals are also fitted to specify what type of vehicle may use the lane. The Sydney Harbour Bridge in Sydney, New South Wales (eight lanes total, three (formerly four) potentially reversible, three reversed daily. Morning peak, six south, two north. Afternoon peak, three south, five north. Other times, four south, four north). The Spit Bridge, Sydney, New South Wales (4 lanes total. Morning peak 3 south, 1 north. Afternoon peak 3 north, 1 south. All other times 2 north, 2 south). The Alfords Point Bridge in the south-western suburbs of Sydney, New South Wales. Three lanes total, with the centre lane reversible using manual placement of plastic bollards. Originally this bridge was built with two lanes, and was to be part of twin spans, but only the foundations and excavations for approach works were built for the Eastern span, and the bridge was opened with one lane used in each direction. New approach works commenced in January 2007 for the second span, at a cost of 45 million AUD, eliminating the need for a reversible lane. However, a 300-metre reversible centre lane will still remain on Alfords Point Road over Henry Lawson Drive, approximately 500 meters north of this proposed bridge. General Holmes Drive generally has four north and four south lanes, but during morning peak hour one southbound lane is divided from the others with a plastic island with signs placed along the top. The island is shifted across by the RTA with a specialized vehicle. This lane is used as a northbound lane for local traffic to get to Botany and Mascot from the St George area. Flagstaff Road in the southern suburbs of Adelaide, South Australia. Three lanes total, with the centre lane reversible. During the morning peak, northbound (downhill) occupies two lanes, and southbound (uphill) one lane. For the remainder of the time (early morning until the next morning's peak), the uphill southbound direction is given dominance. Johnston Street, Melbourne, Victoria. Five lanes total, with the centre lane reversible. Queen's Road, Melbourne, Victoria. Five lanes total, with the centre lane reversible. East BroadWay between Front Street and Crow Lane, main routes in to Hamilton (three lanes total, one reversible). Avenida Radial Leste in São Paulo has about ten lanes total (five in each direction) in most sections (but it varies slightly in others), and on weekdays it has one lane (sometimes two lanes, depending on traffic conditions) reversed during the rush hour (in the morning and in the evening) to reduce traffic congestion. In the morning, the eastbound lanes are reversed to the west (downtown), and in the evening, the westbound lanes are reversed to the east (suburb). Victoria Bridge in Montreal, two lane, one in each direction. Both lanes are inbound from 6am to 9am, and outbound from 3pm to 7.15pm. 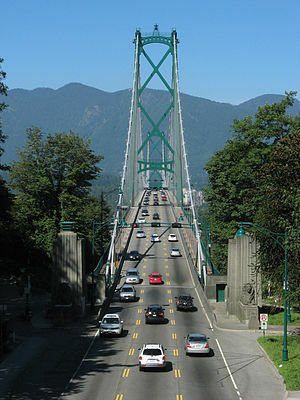 During the 2010 Winter Olympics, British Columbia Highway 99 was subject to lane control in three-lane sections of the highway, via signs on the side of the road that were changed manually. State Route 102 near Kraljevica leading southbound to the Krk Bridge used to have a three-lane passing lane combination, blind curves, and a steep grade. It was later changed to a passing lane combination that makes the northbound traffic dominant. Reversible lanes are frequently used in hilly sections of highways with heavy truck traffic. Most of them were built during the 1980s and 1990s. The A38 road across the Tamar Bridge and through the Saltash Tunnel in Saltash, England. The middle lane is reversible, allowing for control of traffic flows in holiday periods and during rush hour. The A61 Queen's Road in Sheffield, England, although it is a very short section (4 lanes total, 1 reversible: allowing for either 3 out, 1 in, or 2 out, 2 in). The A470 North Road in Cardiff, Wales, A section of around 1 mile long between the Maindy Road Junction and College Avenue where the road drops from a dual two-lane to a three-lane section. One lane is always dedicated to Northbound (out of town) traffic, and one lane to Southbound (city centre bound traffic) with the centre lane reversing depending on the time of day - i.e. in the morning 2 lanes into the city, 1 lane out, in the evening 2 lanes out of the city, 1 lane in. The A15 in Lincoln (Canwick Road) has a short three-lane section of tidal flow. The A38(M) Aston Expressway in Birmingham has 7 lanes, 3 of which are flexible according to rush hour traffic flow direction/time of day. In Montgomery, Norman Bridge Road through the Garden District and Old Cloverdale has a center lane with reversible markings and traffic flow lights between Burton Street and Legrand Place. The Anton Anderson Memorial Tunnel between Portage and Whittier is a 13,300 feet (4,050 m) long, reversible single lane tunnel, shared between vehicular traffic and trains. The direction of traffic alternates every 15 minutes, with periods allowed for train traffic each day. In Phoenix on 7th Avenue between McDowell Road and Northern Avenue, and 7th Street between McDowell Road and Cave Creek Road/Dunlap Avenue. On both roads, the lane configuration is 2 southbound and 3 northbound, with the center lane open for southbound traffic between 6-9am and open to northbound traffic between 3-6pm. Left turns are prohibited from the reversible lane at most arterial and collector street intersections during these hours but still allowed at driveways and non-signaled street intersections. Lafayette Street in Santa Clara - the center lane is used for northbound traffic on weekday mornings, southbound traffic for weekday afternoons, and as a center turning lane at other times. NW 199th St in Miami between NW 27th Ave. and NW 2nd Ave. there are two lanes always dedicated to Eastbound and Westbound, west of Florida’s Turnpike there are two reversible lanes, and west of the turnpike, there is one reversible lane. The replacement of the Toms Bayou Bridge in Valparaiso will utilize reversible lanes in 2018. South Atlanta Street in Roswell, Georgia as part of Georgia State Route 9 is 3 lanes between with overhead lane-use control signals Marrietta Highway (SR 120) and the Chattahoochee River. Northside Drive in Atlanta: the center lane of three is reversed using overhead lane-use control signals. Vineville Avenue in Macon: the center lane of three is reversed using overhead lane-use control signals. In Indianapolis, Fall Creek Parkway North Drive between Central Avenue and Evanston Avenue has 5 lanes (7 in some sections) with 1 lane marked as reversible. Configuration is typically designed to allow for 3 in, 2 out during morning rush hours, and 2 in, 3 out during afternoon rush hours. Due to Fall Creek Parkway's proximity to the Indiana State Fairgrounds, lane configurations change periodically to facilitate traffic flow during events at the fairgrounds. Nicholasville Road (U.S. Highway 27) in Lexington has reversible lanes (lane signals, no physical separation) starting at its intersection with Rose Street at the University of Kentucky campus and ending at New Circle Road, the city's inner beltway. During morning rush hour, as well as the hours before UK football home games, southbound traffic (away from the UK campus and downtown) is restricted to one lane between campus and Southland Drive, and two lanes from Southland to New Circle. Northbound traffic faces the same restrictions in the evening rush hour and immediately after football games. During off-peak hours, an equal number of lanes are dedicated to traffic in each direction. One dedicated left-turn lane is always provided regardless of the current traffic configuration. Baxter Avenue and Bardstown Road (U.S. Highway 31E) in Louisville have reversible lanes (lane signals without any physical separation) for 2½ miles through The Highlands, starting at their intersection with Lexington Road in the north and ending at Douglass Boulevard in the south. This stretch of road has four lanes, but on-street parking frequently restricts traffic to one lane in each direction outside of rush hours. During rush hours, parking is prohibited north of Douglass Boulevard. Southbound traffic leaving downtown Louisville is restricted to one lane during the morning rush hour, with northbound traffic having the same restriction during the evening rush hour. Also, the lane immediately to the left of rush-hour through traffic becomes a dedicated left-turn lane. Electronic signs over the roadway alert motorists to the traffic flow dedication of each lane. According to a 2017 traffic study, this is the only road in the United States that has both lane lights and on-street parking. A current proposal calls for ending this traffic arrangement in the near future. The Chesapeake Bay Bridge near Annapolis (5 lanes total, all marked reversible, 1 usually reversed for normal peak traffic). However, due to its dual spans, when there are 2 eastbound lanes and 3 westbound the opposing sides are completely divided, this is the usual configuration. The Hanover Street Bridge in Baltimore has 5 lanes total marked reversible, with 1 usually reversed for normal peak traffic). Georgia Avenue in Silver Spring has 7 lanes. During most hours, the center lane is marked with a yellow lit X as a left turn lane for both directions. During morning and evening rush hours, the lane is marked with a down facing green arrow – southbound in the morning, northbound in the evening – or a red X – northbound in the morning, southbound in the evening – and left turns are prohibited. Colesville Road in Silver Spring has 6 lanes. During off-rush hours, three lanes go in each direction. During morning rush hours, four lanes (marked with green arrows) go southbound, while northbound (marked with Xs in those lanes) is relegated to two lanes. During afternoon rush, the process is reversed. The Mackinac Bridge near St. Ignace treats the passing lane of the southbound side as a temporary northbound lane during the Labor Day bridge walk, at which time the northbound side is used for pedestrians. Like 7th Street and 7th Avenue in Phoenix, at one time Michigan Avenue in Dearborn had a reversible lane between Telegraph Road and the Southfield Freeway which was marked with lane signals. These have since been removed. Dodge Street between Turner Boulevard and 68th Street in Omaha: no physical separation; lanes marked with overhead lane-use control signals. Center lane direction is eastbound from 5:50am–9:00am and westbound from 9:00am–5:50am. Farnam Street between Saddle Creek Road and 57th Street in Omaha: no physical separation; lanes marked with lane-use control signals and LED signs. On weekdays the direction is one-way eastbound 7am-9am, and one-way westbound 4pm-6pm. Since 1970, the Lincoln Tunnel Approach and Helix in Hudson County supports an "XBL", or Exclusive Bus Lane, on New Jersey Route 495 during the weekday morning peak period (approximately 6:00 a.m. - 10:00 a.m.). Eastbound buses travel in this reversible lane to the approach to the toll plaza at the Lincoln Tunnel, at the other end of which is the Port Authority Bus Terminal in Midtown Manhattan in New York City. The lane is fed by the New Jersey Turnpike at Exits 16E and 17, and the western terminus of New Jersey Route 3. Both the tunnel and terminal are owned and operated by the Port Authority of New York and New Jersey, the bi-state agency that also operates the 2.5-mile (4.02 km) reversible, express bus lane along the left lane of three westbound lanes. The XBL serves over 1,800 buses, which transport more than 65,000 persons, each morning and is a major component of the morning "inbound" commutation crossing the Hudson River. Over 100 bus carriers utilize the Exclusive Bus Lane. New Jersey Transit operates numerous interstate bus routes through the Lincoln Tunnel, as do numerous regional and long distance companies. Each of the travel lanes in the Lincoln Tunnel's center tube is reversible. In general, both of the lanes, including one "XBL" (Exclusive Bus Lane), serve Manhattan-bound traffic during the weekday morning rush hour, both of the lanes serve New Jersey-bound traffic during the weekday evening rush hour, and one lane is provided in each direction during other time periods. The Walt Whitman Bridge, Ben Franklin Bridge and Commodore Barry Bridge over the Delaware River between New Jersey and Pennsylvania use moveable medians, to create zipper lanes. Delancey Street in Manhattan has two lanes on the eastbound side adjacent to the median used for westbound traffic in the morning rush hour between the Williamsburg Bridge and Allen Street. All traffic in these lanes must continue to and then turn left onto Allen, during these times left turns are prohibited from the regular westbound roadway onto Allen Street. Manhattan Bridge in New York City has three lanes on the lower level, which can have all lanes used in one direction or reversible with two lanes one way and the other for the opposite direction. The upper level of the Queensboro Bridge in New York City has four lanes and can have all flowing outbound (PM peak), or two lanes each direction in normal configuration. The Mid-Hudson Bridge in Poughkeepsie, New York has a reversible center lane used during rush hour. Since the closure (2005) and implosion (2007) of the former Charlotte Coliseum (II), this road is no longer reversible; all lights have been removed and lane signs are permanent. It was designed this way for Coliseum traffic from NBA games and concerts. This road is the access road to Charlotte Motor Speedway from the city, and links to Interstate 485. It is used for any events at the Speedway. The lanes have rarely been reversed (even for special events that cause traffic to back up for miles) and the city has finally removed them, converting the street to three south-bound lanes, two north-bound lanes, and one left-turn lane. At least one road in Sandusky has reversible lanes, for the purpose of allowing quick departure of Cedar Point guests. The Liberty Bridge near the southern terminus of I-579 in Pittsburgh has 4 lanes, all of which are potentially reversible, and 2 of which are reversed based on rush-hour times. The West End Bridge in Pittsburgh has 4 lanes, which are all potentially reversible. West General Robinson Street near Heinz Field in Pittsburgh has 4 lanes, and 2 are reversible. U.S. Route 70 in Nashville has three reversible lanes (lane signals, Traffic Lights, without any physical separation) from Korean Veterans Blvd. to just east of a Railroad crossing, there is a break in the reversible lanes between Willow St. and Lindsley Ave. The Victory Memorial Bridge in Nashville has 5 lanes, with only the center lane begin a reversible lanes (lane signals without any physical separation). West Alabama Street and North Main Street in Houston – both are three-lane streets, which operate in a 2 in, 1 out configuration during the morning rush, a 1 in, 2 out configuration during the evening rush, and a 1 each way + two-way left turn lane at other times. 5400 South (State Route 173) in Salt Lake County between 1900 West and Bangerter Highway has seven lanes, three of which are reversible and include a center turning lane at all times. Washington Boulevard (State Route 237) in Arlington County between 13th Street and Wilson Boulevard - this one-block section has only 3 lanes with the center lane reversible by overhead light up indicators. The A38(M) motorway (also known as the Aston Expressway) in Birmingham, England. The road connects the city centre with Spaghetti Junction on the M6. It is a 2-mile, 7-lane section of motorway with no central reservation, and a lower than usual speed limit of 50 mph. Constructed in 1971, it was the United Kingdom's first contraflow road. Overhead lane control signals allow for 4 lanes in and 2 out in the morning rush hour, reversed in the evening, and 3 lanes each way at all other times. One dividing lane is closed to traffic at all times, and motorcycles are permanently prohibited from using the central, red-surfaced lane (with a fixed sign) owing to its use as an off-camber drain. The lane control signals can be set to allow travel in either direction for any lane in exceptional circumstances, which has been used for single-lane, reduced-speed running in each direction (or 2+1 with no divider) during road work, allowing the expressway to remain largely open even during major repairs. However, the 7-lane section splits at both ends to fully divided sets of 4x2 lane slip roads, with the central red lane ending in a barrier, so full use of this flexibility is uncommon and occasional overnight closure is required. U.S. Route 78 in Snellville, Georgia, United States, has 6 lanes in total. This occurs from the limited access portion through Stone Mountain Park to Georgia State Route 124 (Scenic Highway) for several miles. The middle two lanes were reversible (usually occurring during rush hour) with a varying lane always reserved as a center turn lane; hence 3 lanes were used for one direction of travel and 2 for the other. Example of an intersection on U.S. 78. However, due to rising traffic volumes during peak hours that made traffic flows equivalent, the reversible lane system was removed in 2009. The Caldecott Tunnel between Oakland, California and Contra Costa County, California previously had three separate bores, with the middle bore switching direction twice daily for rush hour traffic. A fourth tunnel bore opened in November 2013 to westbound traffic. Two bores are now permanently used by westbound traffic, and the other two by eastbound traffic, with no reversible lanes. The Elbe Tunnel near Hamburg, Germany is part of the Bundesautobahn A7 and has four separate bores, of which two can be switched to allow travel either in each direction or unidirectionally. Theodore Roosevelt Bridge in Washington, D.C.
A reversible lane, also called a zipper lane, is in use on eastbound Interstate H-1 for traffic heading from Leeward Oahu to Pearl Harbor. It is open from 5:30 to 8:30 a.m. The Golden Gate Bridge (6 lanes total, 2 reversible), connecting San Francisco with suburban Marin County. Prior to 2015, opposing traffic lanes were separated only by plastic pylons, which were moved several times daily by hand and provided minimal physical separation. Installation of a movable median barrier was completed on January 11, 2015. Interstate 75 and Interstate 575 north of Atlanta will have a reversible HOT roadway. Sections are still incomplete. Lincoln Tunnel between Weehawken, New Jersey and the New York City borough of Manhattan has three tubes with two lanes each. The center tube carries two lanes in peak direction weekdays (with a reserved inbound bus lane during the AM rush period) and a single lane each direction off-peak (nights, weekends, holidays). Multiple freeways in Houston have reversible center HOV lanes operated by Houston METRO. A1 motorway between the interchanges of A9 and A6, Amsterdam, Netherlands. A two lane carriage is opened in the peak direction during rush hours. A10 motorway, Second Coen Tunnel, Amsterdam, Netherlands. One of the tubes is opened in the peak direction during rush hours. The Anchieta/Imigrantes highway system in Brazil contains the world's longest fully reversible road (The Imigrantes variant at a length of 58.5 km). It comprises a total of 10 lanes distributed over 4 separate roadways (3+3+2+2), each of which can be reversed. Traffic flow is unidirectional on up to three roadways at a time, in different combinations, depending on demand. Since this highway system is the only quick route from São Paulo to the beach, the majority of the traffic on Fridays and Sundays are cars on weekend trips, creating highly asymmetrical demand. In Washington, D.C., the Rock Creek and Potomac Parkway between the Lincoln Memorial and Calvert St. is converted from two lanes in each direction to one-way southbound in the morning and one-way northbound in the evening rush hour Monday through Friday, excluding federal holidays. The P Street exit, usually unavailable northbound, is an allowed left exit in the evening. South of Virginia Avenue, two lanes are closed during rush hours to facilitate the merge to or from Virginia Avenue. There are no overhead markings, but police barricades block wrong-way entrances to the roadway. Sherman Access in Hamilton, Ontario. 2 lanes total, both marked as reversible, with both lanes flowing in the same direction during rush hour each weekday. Assembly Street and Bluff Road (both part of South Carolina 48), along with Shop Road and George Rogers Boulevard in Columbia, South Carolina, are one-way during University of South Carolina football games at Williams-Brice Stadium. The lower deck of the Centre Street Bridge in Calgary, Alberta is fully reversible. It normally allows for two way traffic, but both lanes flow in the same direction during rush hour each day. Victoria Bridge, in Montreal, Quebec, normally allows for two-way traffic. But during rush hours, it only allows one-way traffic, northbound in the morning, and southbound in the afternoon. Farnam Street in Omaha is a normally two-way, two-lane street that during rush hour becomes one-way eastbound in the morning and westbound in the evening. Sierichstraße in Hamburg, Germany, a fully reversible, two-lane city street. The 4th Street Bridge in Los Angeles, a fully reversible street controlled by overhead signals. It switches direction every rush hour and on weekends. In case of emergencies, the bridge can be one-way to or from Los Angeles. The White Nile Bridge connecting Khartoum and Omdurman in Sudan, with 4 lanes total. Traffic is generally directed equally, 2 lanes to Khartoum and to lanes from except in the morning, where it's 3 lanes towards Khartoum, and in the evening, 3 lanes towards Omdurman. In Hong Kong, most vehicular tunnels are dual tube. In the early hours one of the tubes will be closed, and one of the lanes in the other tube carries reversed traffic. The Baker–Barry Tunnel, one of only two means of access to the Marin Headlands from U.S. Route 101 in Marin County, California, is not wide enough to accommodate bidirectional traffic. It consists of a single reversible lane for automobiles and two bicycle lanes. The direction of automobile traffic alternates every five minutes, controlled by a traffic light at each end of the tunnel. The bicycle lanes, one for each direction, are located on either side of the reversible lane; buttons on either side of the tunnel trigger flashing signs alerting drivers entering the tunnel to the presence of cyclists. The Southern Expressway in Adelaide, South Australia was the world's longest exclusively one-way reversible road. It opened in 1997 and eventually traversed 21 kilometres (13 mi) though the city's southern suburbs, until its duplication to carry two-way traffic completed in 2014. It changed direction to carry peak hour traffic to the city centre in the morning and away from the city in the evening. On weekends, the directions were reversed. In shopping centres and metro stations there may be an odd number of escalators, with one or more escalators running in different directions in different time of a day. Wikimedia Commons has media related to Reversible traffic lanes. ^ Richard F. Weingroff. "How the Uncommon Became the Commonplace". Public Roads (January/February 2015). ^ "Google Map satellite image of West Caldwell NJ". Google Maps. Retrieved February 14, 2014. ^ "Evaluation of Lane Reduction "Road Diet" Measures on Crashes". U.S. Federal Highway Administration. April 12, 2012. Retrieved June 1, 2013. ^ 3 lane roads such as this are typically created as part of a "road diet," with remainder of the road becoming bicycle lanes. ^ a b c d e Freedman, Amy (December 30, 2011). "When are area roads reversed?". WTOP. Washington, DC. Retrieved May 12, 2018. ^ "7th Avenue and 7th Street Reverse Lanes". City of Phoenix. Archived from the original on November 1, 2011. Retrieved November 9, 2011. ^ Google (June 2, 2013). "Fall Creek Parkway at Indiana State Fairgrounds (Indianapolis)" (Map). Google Maps. Google. Retrieved June 2, 2013. ^ Chipman, Melissa (November 15, 2017). "Can Bardstown Road be fixed?". LEO Weekly. Retrieved July 10, 2018. ^ Bailey, Phillip M. (June 7, 2018). "Louisville looks at killing rush hour lanes on Bardstown Road". The Courier-Journal. Retrieved July 10, 2018. ^ a b c "The Lincoln Tunnel Exclusive Bus Lane". Lincoln Tunnel. Port Authority of New York and New Jersey. December 28, 2012. Retrieved May 14, 2013. ^ "Lincoln Tunnel HOT Lane Feasibility Study" (PDF). Port Authority of New York and New Jersey. 2009. Retrieved April 4, 2012. ^ "Hawaii Zipper Lane Information". Hawaii Department of Transportation. Archived from the original on October 17, 2008. Retrieved May 21, 2013. ^ Asimov, Nanette (11 January 2015). "Golden Gate Bridge work finished early as barrier is installed". San Francisco Chronicle. Hearst Newspapers. Retrieved 11 January 2015. This page was last edited on 10 February 2019, at 20:46 (UTC).